I rather like the modularity of Age of Sigmar, and there's been discussion in some threads about Forge World making warscrolls for Chaos Dwarfs, which should be forthcoming in the next month or two. Well, never one content to wait, I decided to have a crack at my own. Now, I'm as new to this system as anyone, and I'm still working my way through all the official warscrolls, but I think I have the basic limits and conventions figured out. There are some neat little bits and pieces in the AoS rules - it's way cleverer than people are giving it credit for, with a lot of emergent synergies: they're just not front-loaded in the basic rules. You have to be a bit more familiar with the rules for individual units to make sense of it as a game. What's presented here is my 8th Edition army book, translated into an AoS Warscroll Compendium, such as those available on the GW website as of...uh...yesterday. Anyway, you can field Legion of Azgorh armies from this too, more or less, so have a look and see if it makes any sense to you. Some of it might be a bit shaky, and there are almost certainly typos lurking around, but it'd be good to get your thoughts. Okay, so that was some ado I guess. This post was last modified: 08-12-2015 05:41 PM by Thommy H.
Quick enough to not play test it one bit - but then I don't think all the other Warhammer Warscrolls has been tested either. Thanks for this Thommy H, for those wanting to play AoS this i perfect! Sending you some well deserved slaves. Fast work indeed! Well done, Thommy! Hey Thommy, well done and many thanks for your work! - What use are blunderbusses? Fireglaives look like the better option all round. Maybe you could give them a better rend-value to make them worthwile vs fireglaives? - Why don't Immortals get blackshard armour? Yeah, good spot with the blunderbusses actually - the Blunderbuss Blast ability only makes them the same as the Fireglaive except in massive units! I'll revise that - maybe let them do more Attacks instead. Immortals don't get Blackshard armour because they just don't! The whole army wears Chaos armour, but Infernal Guard have a little bonus to theirs because of the rituals they undergo. Blimey, that was quick. I particularly like the Glory of Zharr ability for the icon bearer - that seems to be getting into the spirit of AoS! Thommy H - you are the MAN! Thank-you for letting me come back into Chaos Dwarfs and play using the new AoS Warscrolls. Now I'm off to the basement to get painting and such! I sure like AoS...it just gives so much flexability to everything...no more having to withhold characters or units because of 8th ed restrictions and such...now it's full-bore fun. I can even write better "Story-based" campaigns and such. Next question - does anyone have any ideas for some Chaos Dwarf Scenery rules? 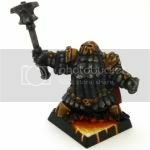 Ps...@ Thommy H - Do you realize you are the "Official" Chaos Dwarf Rules for Monster Hobbies? - well, not personally, but I mean to say that your rule set is the one I'm allowing people to play with...that person, so far, is myself! I've updated the attachment in the first post. Some minor wording and formatting errors have been corrected, and rules-wise I've fixed the blunderbusses (they now do D3 damage) and added one of those "silly" opponent interaction rules to Gorduz's warscroll. The Iron Daemon's Boiler Move rule has also been clarified slightly. I think that's it! The tenderiser's in as the Doom Harness (with Piston-mounted Hellhammers). I've never done rules for the others but maybe I'll give the Skaven weapon teams a look and see if it gives me any ideas. Sorry, another update: I forgot to put some formations at the end. You can now use a Legion of Zharr or a Doom Convoy with your collection! I mocked up this little card-sized version and was going to ask you to do the whole army like it, but then I realised that if it was just in classic army summary style (page at the back of the army book with every unit stat and named special rules) that it would actually be so much better. You don't have to do either though, this is just my way of getting out my frustrations with the awfully inconvenient warscrolls format. Well, that certainly saved me doing this Nice one! All right, a couple of tweaks. I've tried to resist altering too much as the last version has been downloaded over 100 times (!) and that means there'll be old versions circulating about. But, since writing a Dogs of War Compendium, I've become a lot more au fait with how Age of Sigmar phrases certain rules and how similar warscrolls work. 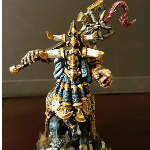 Apart from formatting and clarifying wording, the only significant alterations are changes to the rules for Acolytes and the Altar of Hashut, changing them from being wizards to having Abilities that trigger in a similar way to spells (basically there's no precedent in AoS for wizards that can't use Arcane Bolt or Mystic Shield, which didn't fit for either of those units). I've also added in a new unit entry for "Mortal Ordnance": the petard, bazooka and swivel gun in other words. They're basically just Skaven Weapon Teams to be honest, but there we go. Another update: a couple of re-worded rules now, but nothing major. The biggest change is the formatting, with new fonts and re-sized graphics so it looks as close as possible to the format of the other warscroll compendiums (compendia?). I doubt anyone will notice the difference, but these are the sorts of absurd little things that whirr around in my head.